Due to the attacks in Brussels this show will be broadcasted next Tuesday. Tonight there will be a lot of music to encourage all of us! Tonight our guest is Ted Milton of Blurt, he will talk about lurt, his solo performances, writtings, his work as puppeteer, etc. Just enjoy these 2 hours! When poet/puppeteer Ted Milton picked up the alto sax for the first time he experienced catharsis and, after his short-lived sax tutor told him he can't teach him anything without spoiling his aspiring pupil's idiosyncrasy, he formed Blurt in 1979 with brother Jake Milton on drums and arts teacher Peter Creese on guitar. Their sound was rough and urgent, though not unfinished – far from it – the sparse vox-sax-guitar-drums instrumentation showed off the taut lines of Blurt's schizo-disco-scapes, able to crowd them with claustrophobia while still keeping a clear, fresh sound. Ted Milton's total lack of interest in smoothing out belied a stronger mind than most. During gigs they found their audiences flabbergasted at first, awestruck at second and hooked in the end. Rumour spread about this crazy three-piece outfit with a madman going out of his mind on bourbon and blowing his sax to shreds. The press soon gave them their full attention. Manchester's Factory Records offered them a deal and they recorded one side for the "A Factory Quartet" double LP. However, it took almost a full year before Factory released the album, much to Blurt's annoyance, so they released "Get" and "My Mother Was A Friend Of An Enemy Of The People" as a single on Test Pressings Records. 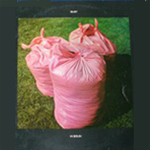 In Berlin they played the "Rock Against Junk" festival and their recorded set was released as their proper debut album, "In Berlin", not on Factory but on Armageddon Records, after Tony Wilson did not see the humour in Ted's comparision of Factory Records with lifestyle-chain Habitat. John Peel invited them for a session and the world was their oyster. "The Fish Needs A Bike" became their second single and probably is to this day their best known song. 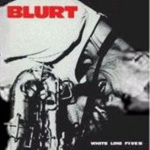 Their second album "Blurt" was recorded in Jake Milton's home studio, this time releasing it trough Red Flame Records and People's Records in Germany. More touring followed and corporate record companies started to show some interest in the band, but only if the would agree to smooth out their sound and take on a bass player. Typically, Blurt reclined the offers and went on uncompromisingly on their mission: to boldly go where no band had gone before. After recording the third album, "Bullets For You", ("recorded live in the Cotswolds Wine Cellars") tensions grew between Peter Creese and Ted Milton. Creese left the band in anger and went back to teaching. The Milton brothers were on their own now but soon found a new cohort in synthesizer player Herman Martin, with whom they toured in 1985. 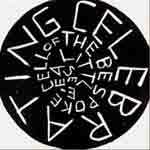 This rare line-up released the cassette "Six Views In Black - Sixty Minutes Of Blurt In Blighty" and appears with one track on the Abstract Magazine #6 LP. Martin left soon after and Blurt went back to the sax-guitar-drums line-up with guitarist Steve Eagles, a former member punk band Satan's Rats and later of pop-punk band The Photos. The 12" "White Line Fever" and another live album, recorded in Kortrijk, Belgium, "Friday The 12th", was released on Another Side Records, an offspring label of Les Disques Du Crépuscule in 1985. Times were changing and the enthusiasm and idealism of the punk and post-punk era had waned in favour of yuppiedom and hard materialism, making life tough for non-commercial acts . In 1985 Jake Milton also left the band. Ted decided to continue, in spite of all financial and personal setbacks and found a new drummer in Paul Wigens. 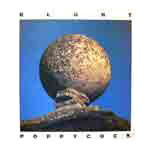 "Poppycock" was to be Blurt's fifth album and the new line-up proved to be a very creative one, taking the music further to new horizons, like on the track "Domain Of Dreams"; a mesmerising feedbacking drone over which Ted recites his poem in his best french. 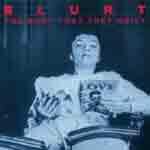 But no record company wanted to invest in Blurt as they had fallen out of fashion, although they kept a loyal but small following, especially in Europe. Ted founded his own label, Toeblock, on which he had already released a solo 12" single, and "Poppycock" became the second release with a distribution deal through Cartel/Revolver. The next album, "Smoke Time", took things even further along the experimental path, with the haunting "The Tree Is Dead" and Paul Wigens adding violin on "Trough By You", an unsettling piece of music far away from the dance-band style of early Blurt. a 12" white vinyl record and a 5-track CD-EP. A hilarious video for the latter got some airplay on MTV, but radio-friendly was and adjective that still didn't fit Blurt's music. 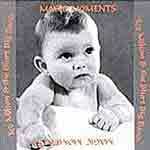 "Magic Moments", the next album was released by Hungarian label Bahia Music in 1994 under the moniker of "Ted Milton And The Blurt Big Band", "big" being five members, heralding the return of both Steve Eagles on guitar alongside Chris Vine, and Nic Murcott on percussion with Paul Wigens manning the drumkit. The album was dark and brooding, reflecting Ted's personal problems on the home front, and the tour to promote it, with guest musicians Baoudoin De Jaere on violin and Adrien Kessler on double bass proved to turn out disastrous when their rented van got stolen in Czechoslovakia. Back in Brussels, life went on in it's dysfunctional ways and Ted teamed up with the Back-To-Normal Big Band from Liege to record the album "Nogales" and take it out on tour. With a love gone sour and also Chris Vine leaving the band, Ted moved back to London, licking his wounds and trying to survive by manufacturing his series of handmade books and taking odd jobs to pay the bills. Blurt seemed to become a thing of the past now, and Ted didn't even touch his sax for some time. However, with the assistance of guitarist Jon Wygens, in 1996, Blurt was revived, recording the album "Celebrating The Bespoke Cell Of Little Ease", with Paul Wigens on drums. Released again on Bahia Music, the album came out as a blistering work of art, focused and highly emotional, with excellent musicianship. Sadly, the album proved to suffer from lack of widespread distribution and remained largely unnoticed. 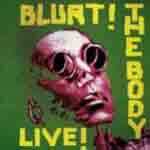 Now it probably is the most sought after Blurt recording out there. So, What's This Mission All About? Blurt went out on tour to promote the "Celebrating" album, with Steve Eagles added as second guitarist, playing wonderfull music to very small crowds. Pearls for swines; Ted, Steve and Paul had gotten used to it, but it might have proven too much of an offer for Jon Wygens, who went on to become a respected composer in the soundtrack and jazz milieus and founded jazz-rock band Limbo with Paul Wigens. The beginning of the new millenium saw a revived interest in all things "No Wave" and Ted saw the times fit for retrospection. Two samplers were released on the "Salamander" label, a quasi official offspring of the Bahia Music label: "The Fish Needs A Bike: The Best Of Blurt, Volume 1" in 2003, again followed by touring with Steve Eagles and Paul Wigens, and "The Body That They Built To Fit The Car: The Best Of Blurt, Volume 2" in 2006, with the drumseat taken over by Bob Leith from "The Cardiacs". 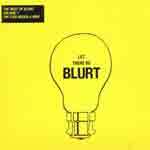 Blurt found themselves rediscovered by critics and new, young audiences, receiving invitations to play major festivals like Glastonbury, Recontres Transmusicales in Rennes and some exclusive one-off gigs. Ted Milton finally seems to get some recognition for his art lately, as proven by invitations for the Berlin International Literature Festival and to join the series of concerts with "Odes", organised in the framework of Patti Smith's art show at the Fondation Cartier in Paris in june 2008. "In Berlin" and their tracks off the "Factory Quartet" got re-released on LTM Records and after nearly ten years they even recorded a brand new album, "Cut It", also released on LTM Records. Manning the drums now is Dave Aylward, who took over from Bob Leith.